How to handle radiator problems? The Home Wizard app calculates your ideal home care program to avoid problems with your Radiators, but sometimes trouble can still occur. Here are answers to questions about radiator miscellaneous. Is it possible to discuss the heating system and all it's difficulties with someone on the phone? It's a 5,000 sq ft house with a heating run thru the garage to the apt above it. Virutally no heat in the apt. Can I shut off the radiators in the apt? What is a good temp to maintain and still not go broke. Current payment plan is $343 but last year it ran over by 1500 and kept the house under 70. This is just one of the many questions I have and can find no one knowledgeable enough about hot water radiant heating systems. I currently am running the system at 63. Good or bad? I think it would be best if you talked to someone who could physically see your heating system, how it is piped and the apartment that you are referring to. For example, someone seeing your situation might be able to determine if there is enough heat from other adjacent areas to keep the apartment above the garage freezing if the heat to it was turned off. On the other hand, being above a garage and if not connected to heated rooms, if you have water pipes in the apartment these could freeze and burst (and the risk of this will depend on what region of the country that you live in). And if you are not going to use the apartment, then it might be practical to drain the water from the plumbing (and from the radiators). You might want to consider talking with a local home inspector, as they are typically quite knowledgeable about radiant heating systems, and how to protect your home (or detached apartment) if you are doing something like turning down the temperature to save energy. Depending on what they see when they look at you situation, they may even recommend that you shut down the heating zone to your apartment, and use a small electric space heater instead. But again, it will depend on what they see in your overall situation, and are familiar with the temperature patterns of the region of the country where you live. The baseboard I want to use is on this site... http://www.alpinehomeair.com/viewcategory.cfm?categoryID=255 Any of the hydronic baseboards will do as long as the size is right. money is extrem;y tight so we are trying to make do with the boiler we aready have. Thank you, for reviewing my question. In general, I would think that your new baseboard radiators would be more efficient than the old-style radiators that you are replacing. And as such, if your existing boiler had adequate capacity, then it should have enough capacity for the new, more efficient baseboard radiators. o The types and efficiencies of lights and major home appliances (which give off heat). And as the webpage discusses, it is best to have a local contractor (who is familiar with your specific region of the country and who can see your home's specific configuration) run the correct sizing calculations (not just us using estimates using "rules of thumb"). The knob that turns the radiator off and on is lost, but I think I found one that fits. which way do I turn it? Is it dangerous if I force it to turn, because it is very stiff in both directions (after a little play). Is it possible to limit the flow without completely turning the radiator off? If I have to turn the whole thing off I will. I assume that you are referring to the manual control valve near the bottom of your hot water radiator, as shown in this photograph: http://farm1.static.flickr.com/41/102438933_5a498be8e0.jpg Correct? If so, then this is a manual control valve, and yes, you can use it to control the amount of heat coming from your radiator by opening or closing the valve. Regarding which way to turn it, it goes by the adage "righty-tighty, lefty-loosey". In other words, as you are looking down on the valve handle, if you turn the handle clockwise (to the right), it will tighten the valve stem into the seat and reduce the flow through the valve. Similarly, to open the valve, you would turn the handle counter-clockwise to open it. But when you say that the knob that you found has a little bit of "play" before it gets stiff, is the play between the handle and the stem? Or is the handle tight on the stem, and the play is stem turning in the valve? You will want to be careful not to strip the stem if the handle is not fitting tight on it. 1) You can turn off your heating system for a while and let this radiator cool down, and then see if the valve turns easier. 2) You can spray some penetrating oil or "liquid wrench" into the valve stem to see if this loosens it up. 3) If you need a way to temporarily reduce the temperature in the room until you can have a service person help you with the valve, then you can cover the radiator with a blanket (ONLY if the blanket is not flammable), and this will act as an insulator, which will keep the room from heating up as much. You need to be very careful with this if your radiator runs very hot, and again, be sure that your blanket is non-flammable. What kind of paint should be used to paint radiators? The short answer is that you might want to consider using something like Krylon "Hi Heat & Radiator" brand paint for your radiator. 1) if you are going to do this project for this winter, you should consider doing it soon, before the weather gets too cold. This is because you will want to open the windows and and run your heating system to allow the smell and fumes that will likely be produced the first time your new paint job gets warmed up by the hot radiator. 2) Regardless of which brand of high temperature paint you choose to use, you should consider using "non-metallic" paint. Non-metallic paint can come in a variety of colors, and will allow your radiator to emit more heat that a "metallic" paint. 3) Although it is not much fun, like any painting project, preparing the surface to be painted is the most important part of the job if you want the final product to look good and to last. Dirt, grime, loose old paint all need to come off if you want the new paint to stick properly. A wire brush, chemical strippers, and an old screwdriver can all come in handy for doing this. Next you will want to put down a coat of and oil-based (not latex) primer that contains a lot of zinc. I'm moving into a house with good ol' cast iron radiators. Whoever painted this house previously painted everything! All the valves and knobs and doohickies on the radiators (and cupboards and doors) are painted solid. Would I be able to clean the paint off or would I be better off having someone replace all those parts? Would the radiators heat better if I took that thick paint off them as well? Before you pay someone to replace all of the valves, etc. on your cast iron radiator, I would suggest that you try first using removing the paint yourself using a drill with a wire wheel attachment, and then a wire brush. This assumes that you will have enough room to get access all the way around where you are trying to scrape off the paint. Regarding whether the radiators will heat more efficiently with or without the paint on them, it should not make much difference. However, it is important that the radiators be painted with HIGH TEMPERATURE paint. You said that the previous owners painted everything, but if the radiators were painted the same color as the walls, then it may be possible that they did not use high temperature paint on the radiators. If this is the case, then when the radiators come on this winter, the paint could begin to put out fumes into your house, and the paint begin to come off. While bleeding my hot water radiators, I lost one of the bleed valve plugs. Where can I purchase a new one? And what can I do besides shut the system off in the mean time? In terms of what to do in the meantime, you are right, the safest thing to do is shut down your heating system until you can replace the bleeder plug. On the other hand, if you have more than one radiator, and there are valves on both sides of the radiator with the missing bleeder plug, then you might be able to shut these valves to isolate this particular radiator and still run your system for the other radiators. But again, this depends on how your system was piped. If you are tempted to put a piece of cork into the plug, or try to force thread something else to act like a plug, you make be asking for a messy hot water leak, or stripping the threads and having to replace the entire valve. Why do apartment house radiators cause so much dust? my windows are shut so it has to be coming from the radiators. How can it be stopped? Regarding your question about why radiators cause so much dust, do you mean "radiators" as in hot water systems that heat pipes in your rooms? Or do you actually mean "registers" for hot air that blows into your rooms? If you mean "radiators" then the dust that is being kicked up in your rooms is likely from the heat currents around your radiators, which cause warm air to rise, and when the air rises it pulls up dust from the floor, which then settles down on your furniture, etc. For radiator heating systems, you can cut down on dust in your rooms by installing a separate electrostatic air purifier in your rooms. If you actually mean "registers" for a forced hot air heating system, then you can cut down dust by installing a central electronic air cleaner on your blower. You can also cut down on dust by installing more efficient air filters. I have a boiler, approx 10 yrs old, in our new home's basement. I've never even heard of one! The radiators in the house all get nice and warm and look majestic. What do I need to do to the boiler? There are controls on it that I don't recognize. The most important thing you can do for your hot water heating system's boiler is having a trained service technician do an inspection and maintenance servicing of it once a year. Other than that, you should ordinarily not need to make adjustments during its normal operation. Having this annual inspection and servicing done is VERY important, both from a safety standpoint and also for energy efficiency. The safety inspection includes checking the pressure relief valve and ensuring that your burner and exhaust ducting are both operating correctly. If you have any additional questions, just let us know. 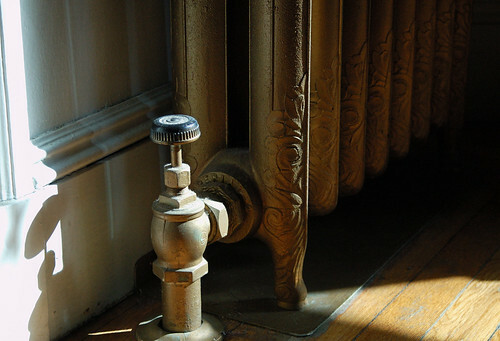 What year did home radiator heating systems stop being built with homes? or What year did they start introducing forced heat built with homes? Regarding your question of "when did radiator heating systems stop being built"?, actually they have not stopped being built. Many homes today are still built with different types of radiator systems, for example, baseboard water radiator systems. Regarding the second part of your question, forced air heating began being used to heat homes back around 1935, with the introduction of the electric fan being used to distribute air through ductwork in the house, and back then, the air was heated by a coal-fired furnace. Later the fuel for the furnace was replaced by oil and gas. My baseboard radiators make a loud bang when the heat comes on in the bedroom. I suspect it is like water hammer. How do I fix it? You say that you hear the bang noise when your baseboard radiator turns on. As such, the noise is probably not coming from a water hammer (which more typically occurs when a valve suddenly closes). 1) A pipe to or from this baseboard radiator that is running through a hole in a wall, etc. that is too tight, which doesn't allow sufficiently for the pipe's thermal expansion. 2) Pipes not supported properly, such that when they turn on, they bang into one another or into other things. 3) The zone valve is installed backwards. 4) Air is trapped in the line, which needs to be bled out. where can i find leather valve seats for my hot water radiators.they're getting hard to find. One of them will hopefully have the leather valve seats that you are looking for. The water main broke in our street. We have radiators that are getting very hot probably because of lack of water. I turned down the heat to 60 degrees. Should I switch off the motor? I wonder whether we will have a problem if I don't. Thanks. If you have lost the main water supply to your house, this actually should not actually affect your hot water radiators. The water that circulates through your furnace and then around to your radiators are in a "closed" system, and therefore this water can continue to circulate even if the main water supply to your home is turned off. However, your system will have a fresh water makeup valve, which is how water can come into your heating system to fill it up, for example, if you are purging air out of the system, or if you have small leaks in the system. And this valve may be manual valve, or it can be an automatic water makeup valve. But assuming that you do not have a major leak in your system somewhere, your radiator heating system should be able to run for a rather long time without makeup water. I am not sure why your radiators would seem to be hotter with the main water supply to your house turned off. There is no reason for it to do this that I can think of. Hi, Do you know anything about Radiator Humidifiers? My house is 60 years old and the heat is dry. I tried putting a metal dish with water in it on the radiator but it doesn't seem any less dry. the radiator is bumpy so it doesn't seem like a lot of the dish's surface is touching the actual radiator. any advice? thank you! As you will read, some of the styles have the water reservoir hanging down in front of the radiator (rather than being placed on top). I would not be concerned about the "bumpy" surface of the radiator not allowing the radiator to transfer enough heat into the reservoir, since if the radiator is operating properly, it should be able to "radiate" sufficient heat into the reservoir to cause it to evaporate water into the room (versus relying on heat transfer from direct contact). However, the big issue is how much surface area of the reservoir is exposed to the radiator, relative to the size of the reservoir. One of our hot water radiators' knob to turn it on or off doesn't turn - it is obviously on and we'd like to turn it down a bit b/c it's in the upstairs and doesn't need so much heat. Is there a way to fix/replace the knob? If you haven't already tried it, you might try applying WD-40, or better yet, Liquid Wrench penetrating oil, to the threads of of the valve, and letting the oil sit on it overnight. Then when you put a wrench on it, first try to tighten it and then pull in the loosen direction with some hard, sharp pulls. If this doesn't work, then wipe off all of the oil, and try carefully heating valve. And just to be sure, double check to confirm that the direction that you are trying to loosen the valve is actually the direction for loosening it. Heat will cause the valve body to expand, which could help free it up to open. My husband and I have sold our house and are moving to a rental while we have a new house built. Our rental is quite an old home, and has radiator heat. We have a one year old daugther. We are wondering how how the covering of the pipes or the radiator become to the touch? Also, are curtains hanging near a radiator a fire hazard? Any information you could give on this matter will be greatly appreciated! You are wise to ask about equipment that is unfamiliar in your new rental house. Regarding curtains near a radiator. Yes, it's a good idea not to let curtains hang in contact with your radiators. Also, you should try to secure your curtains so that they hang BEHIND your radiators, so that they force the heat into the room rather than out to the window. What are the turn knobs on the bottom of the radiators for? I believe I have a flowing water system. Also what do I need to do to the boiler to get it ready for the winter? If you are referring to the radiator knob shown in this photo (http://farm1.static.flickr.com/41/102438933_5a498be8e0.jpg ), then this is the valve that allows hot water to come into your radiator, when you want to turn it on to heat your room. HOW DO I SHUT OFF THE HEAT FROM THE HEATER? To answer your question about how to turn off your heater, I'll first need to know what type of heating system that you have. For example, is it a radiator or baseboard heating system? Or is a forced air distribution system? And does your heating system have separate thermostat controls from your air conditioning system (if you have central air conditioning)? Just let me know, and then I can hopefully give you the correct advice for your particular type of heating system. It sounds like you might have a small water leak somewhere in your system. The first place to check is the outlet discharge pipe of the pressure relief valve, which will be located near your boiler. Sometimes the pressure relief valve will open when the pressure is too high in your boiler (which this valve should do), but the valve has trouble seating tightly afterwards. And this small leak could be the cause of the problem that you are having. If the outlet discharge pipe from your pressure relief valve is dry, then you will want to look at the other valves and circulation pumps for your system, to see any evidence of leaking water. Hopefully you will be able to find any leak out in the open where you can see it, and it is not coming from some old solder joint that is buried in a wall or under your floorboards. I have a circulating hot water radiators. One radiator did not get hot enough so I tried to bleed it. There is a valve toward the top of the radiator with a knurled screw on top. I unscrewed it and pressed a screwdriver into the top and cold water came out. I thought this was ok but the cold water never stopped coming out. How much cold water can I expect to come out? The radiators before and after are warm. Do I continue to bleed this valve until no water comes out? I cannot move the turnoff valve on the opposite side of the radiator. I did not want to force it. Do I need to call in a professional to help? Also, I have the aquastat on my oil furnace set at 160 degrees. Is this sufficient for home heating purposes? I was told the range is 120 degrees to 180 dgrees maximum. The household hot water is heated separately by a gas Hot Water Heater. And regarding your question about bleeding your radiator, you should just need to bleed out the air, not the cold water. And regarding the appropriate set temperature for the aquastat on your boiler, this will depend on your specific boiler and the configuration of your system. We have a cast iron radiator. We are trying to take the control valve off of the pipe coming out of the floor but it won't budge...any suggestions? If you haven't already tried it, you might try soaking the valve threads overnight with WD-40 or better yet, Liquid Wrench penetrating oil. Then when you put a wrench on it, first try to tighten it and then pull in the loosen direction with some hard, sharp pulls. And just to be sure, double check to confirm that the direction that you are trying to loosen the valve is actually the direction for loosening it. Water shoots out of my steam release valve on my one pipe radiator system. what do I do? If your problem is water squirting out of an AIR vent, accompanied by hissing noises, then this indicates that the steam valve has not been shut off tight or that the steam valve has a worn-out seat. If its not your AIR vent, just let us know where the vent is located, and what the vent looks like, and we can try to help you further. What oil do you use in a oil radiator? are they refillable? Typically, an oil-filled radiator is NOT refillable. Has yours leaked? Or were you just wondering if there is maintenance required for the oil in your radiator? We have a room that over 25 years ago had a radiator in it that was unhooked and taken to the garage. We now want to use the room again. The pipes are still there. Is it possible or advisable to hook up that old radiator or would it be too corroded inside? If possible what could a do it yourselfer do to prepare it for being returned to service. Follow Up to the question about hooking up an old radiator . . . I'm talking about a hot water system that is run totally by gravity. There is not even an electric pump. It's very old but has been very trouble free for many many years. Since a gravity hot water heating system does not have a circulating pump, it operates on the principle that hot water rises and cold water falls. If you put a radiator into the system that has a lot of corrosion, this can make it difficult for the water to circulate. Hi. 140 yr old house. Radiators. When heating thermostat is off, 2 of the radiators still get hot. Related to water heating? It's a little difficult to diagnose without physically seeing your system, but what might be occurring is that your heating system may be plumbed such that there is a common return between your radiators and your hot water tank . So you may be getting hot water flowing back though the radiator circuit, even though the thermostat for our radiators is not calling for heat. If you have a 3-way valve that diverts hot water between the two systems, then this may have failed, and allows hot water to reach two of your radiators. But again, it's difficult to diagnose without knowing more about your systems. how do i dismantle cast iron radiators? Is this what you needed? If not, let us know, and we'll try to find something else for you. When we had the hot water radiator system tested when buying our 1910 home, one of the radiators spewed water. The technician shut the boiler down and drained the system, which has been sitting empty since March. We just took out the old radiator, have purchased a replacement radiator of similar dimensions from a reclamation center and want to test it for cracks/leaks. My plan is to plug on end of the radiator, attach a garden hose to the other (with adaptor fittings, open the bleeder valve and fill it up. Will this work or do I need something with more pressure than a standard outside faucet and garden hose? Yes, this should be fine. A typical boiler for a hot water radiator system runs at 12-15 psi, and a typical garden hose runs at 40 psi. So you should have plenty of pressure from your garden hose to test your replacement radiator. I have a radiator that is running hot even though the heat is turned off...what is that a sign of and what should I do? How long does your radiator continue to run hot after the heat is turned off? If it is just a short while, this is called "pump overrun", and it is when your circulation pump continues to run to take heat away from your boiler to keep it from overheating.